This house has 7 bedrooms and 2 bathroom and a shower room. On the point of Saint-Jacut-de-la-Mer, 15 km from Saint Malo, this villa of 180 m², made of stones in the early 1900s, can accommodate 11 people, offers a beautiful view of the Bay. The living room (35.70 m2) and dining room (24.06 m2) are separated. 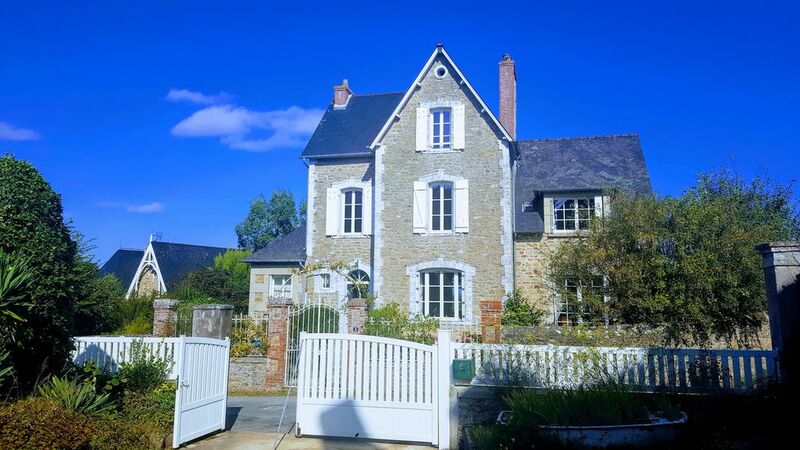 It is an ideal place for a family vacation, quiet, in Brittany. The large plot surrounding the villa can be used as a playground for children. The garden is fenced. - 7 rooms including 4 with 2 single beds, 2 with 1 single bed and one with 1 cot. - 2 bathrooms (bath, basin and toilet) and 1 bathroom (shower, toilet, sink) and a separate toilet. - A kitchen (cutlery, crockery, oven, refrigerator, dishwasher). There is also a TV and a washing machine. The site is on a Breton point, you will need your car to get places that are present within a radius of 50 km. I am Belgian married with 3 children and 2 granddaughters. This is a family house. My great aunt bought the house after the second war. I have got many memories because I have been there for more than 50 years. The view is breathtaking and the house has got many charms inside as wooden ceilings and old furniture. Nous étions onze a séjourner dans cette grande demeure familiale. Nous avons tous adoré. Une vue magnifique et un temps ensoleillé, tout était idéal pour un séjour mémorable. Nous avons passé un excellent séjour dans cette belle maison. Vue exceptionnelle sur la baie de Saint Cast. La maison est proche du centre du village et de la plage des Haas. Nous avons passé un excellent séjour dans cette maison pleine de charme. C' est une vraie maison de famille, bien entretenue ce qui lui donne une atmosphère chaleureuse. Nous avons séjourné fin Août dans cette grande maison bourgeoise qui jouit d'une vue très apaisante sur la mer. les pièces à vivre sont spacieuses et lumineuses. La maison est parfaitement équipée, très proche des commerces et des plages. Nous étions 8 et chacun pouvait s'isoler s'il le souhaitait tant l espace est important. Le propriétaire a laissé beaucoup d'objets personnels du coup on a l'impression de poursuivre l'histoire de cette gentilhommière. Je la conseille pour des vacances en famille et j'y reviendrai très certainement. The site is accessible from the airport, 12 km Dinard or the highway is 80 km. In addition, the house is 100 meters from the city center, small shops are easily accessible. You will also find the beach 800 meters away and Saint-Malo 15 km.